My friends and I have been amped up for the long-awaited grand opening of Bell's County Line Pub and Eatery in Factoryville/La Plume right on the Lackawanna and Wyoming County line on Route 6&11. The last time I had food in this location, it was called Jim's Place and it was probably about a decade ago. So with much enthusiasm, but with tempered expectations because it was opening night, a group of us headed to Bell's hoping for the red carpet treatment. The place was packed to the gills, so we certainly expected a lengthy wait, which we did experience, but the greeter and waitress were very attentive and kept the ice cold $2 draft beers coming. This great deal is enough to keep me coming back regardless of how the food was. 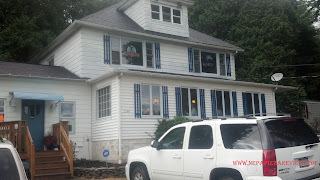 We enjoyed the tavern atmosphere which is kind of spread out throughout various rooms on the lower level and had a fun time in the relaxed dining area. After a while, our food was finally delivered to our salivating mouths' delight. I'll keep the pizza review brief because I want to discuss the other items we ordered as well. 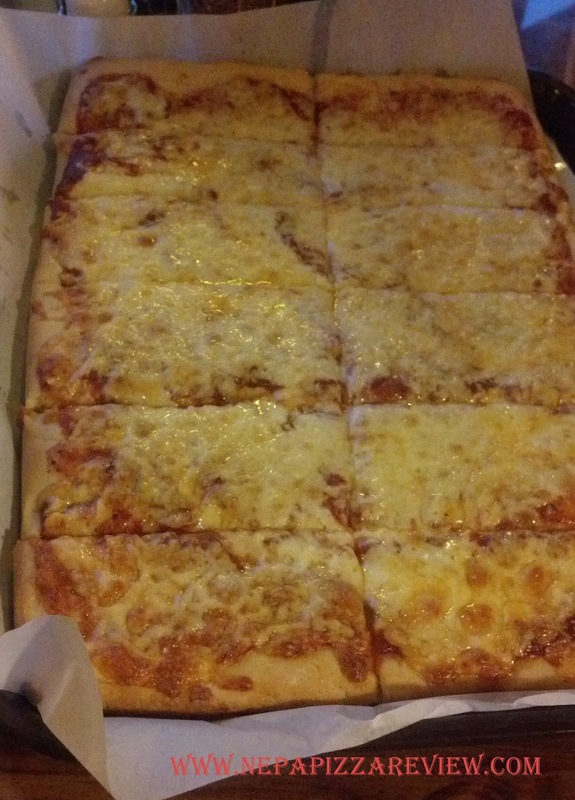 The pizza was old forge style, and was certainly cooked as perfectly as it could have been. The crust was premanufactured, but cooked to a golden brown, and was clearly everyone at the table's favorite component of the pizza. Bell's "signature sauce" was simplistic, and drew comparisons to store-bought sauce that comes in a jar. 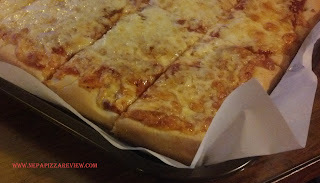 It was a bit out of place, and really belongs on a round pizza, rather than on an old forge style. In my opinion, an Old Forge pizza needs to be a bit more complex, and cooked before being put on the pizza. The cheese too was out of place, as it was a blend of mozzarella and possibly cheddar. This would have worked better on a round pie. Overall, none of us particularly that the pizza was all that exceptional, and thought we could make a similar pie at home. So maybe this isn't the best pizza in NEPA, but what really wowed the troops were the wings. We ordered several orders of hot and mild, and all were cooked to crispy perfection, were nice and meaty, and the sauces were amazing. I usually prefer the hot variety, which were awesome, but the mild were particularly good. There was so much flavor packed into this wing, but the sauce wasn't spicy at all. Usually mild sauce at other restaurants is just more watered down than the hot, but this sauce was complex and really flavorful without being spicy. I'm guessing there was some mollases in the sauce, and one person detected a little mustard. Whatever the ingredients - kudos to the chef, because these were the best wings I've had in a long time. It is absolutely worth the trip to Factoryville for the wings alone. The rest of the menu is filled with traditional Pub food, and looks appealing, and I don't doubt that it would all be pretty good. 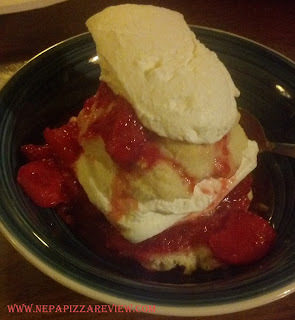 The other item I ordered was "Grandma Bell's Strawberry Shortcake" which was nothing short of perfection. The whole thing is made on top of a fresh-baked sweet biscut and topped with strawberry and whipped cream goodness. I voiced my approval to Grandpa bell who is a very lucky man! Before I knew it, the shortcake had vanished into thin air, and I was left wanting more even though I was stuffed at this point. If you are in this area, do yourself a favor and finish your meal with desert by Grandma Bell, it's incredible. UPDATE: I enjoyed the wings and raved about them so much that another friend who was not in attendance that night wanted to try them so I went back the very next day for more! On this more normal day, the service was exceptional and the wings were perfect yet again. If Bell's can keep up the good work, this will be my regular wing spot for some time to come! Great place to eat and hang out. We weren't fans of the pizza, but the wings and desert were out of this world. I'd highly recommend you put this place on your priorty list to eat soon! Update: after eating at Bell's again, the good new is that the place is very consistent and that the wings were very good again. The bad news is that my opinion on the pizza also stays consistent. Update: It would appear that Bell's has reformulated their cheese blend a bit since my last review. Not sure what exactly they are blending, but I'm guessing mozzerella and cheddar. I'd call it a vast improvement. I'd suggest that they use a larger blade to grate the cheese though, it would melt better and dry out less. Kudos on the improvement though!